Roy and George Harrison in the studio. Copyright © Phil Hatton. Used with permission. Hello ... Hello ... my old friends ... It's great to see you once again! Friday 6th December 2013 brought up the 25th anniversary of the tragic passing away of the late, great Roy Orbison and, sadly, the second anniversary of the death of his beloved wife Barbara. Roy was a definite and absolute musical hero for me and many others including, of course, Jeff Lynne and a plethora of modern day music greats. 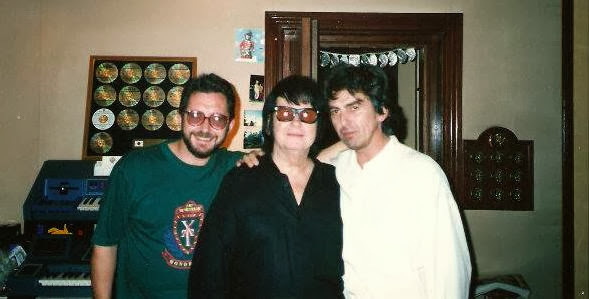 For personal reasons, my favourite Roy Orbison song was "Blue Angel" - a song that Kelly Groucutt sang beautifully for me on a dark night back in September 1992. Whether it be the chart-topping brilliance of his Sixties career or his astonishing and superlative comeback in the Eighties, both solo and with The Traveling Wilburys, we all have our own Big O gems to treasure in our hearts. Indeed, the man is still much missed.